The property was called Ashley Farm and was located 25 mules north west of Port Lincoln at Wanilla. This embarkation Roll shows Robert Holman's embarkation details. Six months after getting married Lel and Dolly moved into their new house on their block No18 in the Hundred of Wannamanna, one mile from the newly established township of Kyancutta. 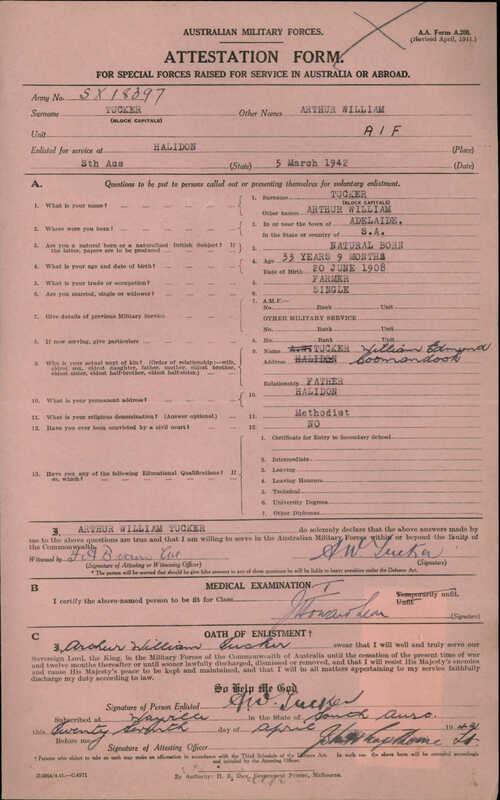 This Extract of the World War I Nominal Roll shows Robert Holman Service number 2351, giving details of his embarkation and return to Australia. Lel or Lal as he was fondly called by relatives and friends lived at Nelshaby South Australia. When his mother, who had not been well for some time, became seriously ill, 9 year old Lel rode his horse to Crystal Brook show to find his mother's relatives. Eliza died soon afterwards. His father had already selected a block of farming land at Wanilla about 25 miles north-west of Port Lincoln with the intention of taking his sick wife to a drier climate. After his mother's death, Lel went to live with his mother's sister Ethel and husband Bill Dow, a teacher at Dodlawirra, South Australia. His father went on with his plans to settle with his children at Wanilla in 1906. He built a house there on what is still known as Holman's Hill. He called the property Ashley Farm. He gathered up his family and travelled there in the Ruparra with Captain Thompson from Wallaroo to Port Lincoln arriving at their new home on the 7th of October 1907. In 1908 he was sent back to stay with the Dow family again for 6 months to complete his schooling. By the next year a school was built at Warunda where his brothers obtained their education, travelling 14 miles a day in a horse and trap. In 1912 Lel and his brother Stan took a share-farming job North East of the small township of Cummins with Mr. Culley. As there was no house on the property, the boys slept in the stables on makeshift beds. The mattresses consisted of Hessian or jute bags sewn together. These were filled with chaff or straw and supported with forked sticks on each corner. They reported proudly having consumed 17 loaves of bread a week. In 1913 when a house was built, their father who had not been able to make a living on Ashley Farm Brought the rest of the family to the Culley farm. It had become too wet at Wanilla with 40 inches in one yar. However by 1914 there were drought conditions in most parts of the state, so Lel's relatives (from Telowie North east of Port Pirie) Fred Holman travelled his team of horses to Ashley Farm where there was an abundance of feed from a self sewn crop. This task took from the 6th until the 21st of October. While Living on Culley's farm, Lel met Dolly, "The Girl next door". Her father had taken up 14,000 acres of virgin land in the Hundred of Stokes. Culleys farm was part of that block. Prior to enlisting in the 1st A.I.F. in 1916, lLel became engaged to Dolly. He served with the 95h Light Horse Regiment in Egypt, was invalided home in 1918 and married Dolly. Lel and Dolly lived in Adelaide for 6 months while a house, built of local limestone, was being erected for them on their Block No.18 in the Hundred of Wannamanna, one mile from the newly established township of Kyancutta. Once settled into their home on the farm Lel and Dolly became involved in the social affairs of the district: they both played tennis, enjoyed dancing and Lel was patron ot the football club for some time. Due to war service, Lel's health was deteriorating. In 1926 Mr Longmire, who was looking for land for his sons, asked Lel to put a price on his farm. Le, not really sure that he wanted to sell just then, put what he thought was an unrealistically high price on it, 8 pound per acre, never expecting it to sell. To his surprise it did! So in 1927 they moved to Adelaide where they stayed with Dolly's sister, Catherine (Mrs Ben Cox of Maylands). By the end of the year, they had moved to Norwood, where they rented a few rooms. Lel found some light mechanical work and in 1928, he bought a house at 5 Grove Ave, Forest Gardens (now Everard Park). In 1929 Lel had a major internal operation for the removal of a large portion of his intestine. After that, needing very light work, he took a job with Sam Honeychurch driving a Packard Hire Car. Meanwhile his Maxwell car was replaced by a maroon Chrysler Six tourer, in which the family spent many afternoons after Sunday School, driving through the Adelaide Hills or visiting family or friends. In 1934 Lel purchased two Packard's and a licence from a hire car proprietor. Requiring only one care he sold the 1928 heavy six cylinder. The other, a straight cylinder, Lel drove himself and proudly took his place on the Returned Soldier's Stand in Pirie Street in the City. Hence began 20 years of R.L.G. Holman's Hire Car Service. Dolly was a dedicated "on call" helper in their home, taking telephone bookings in what was to become a 24 hour a day, 7 day a week business. IN 1937, Lel sold the Packard and bought a 7 passenger 1935 Buick registration 385 which was both his pride and joy and the family car. By about 1940 a 7 passenger Cadillac Reg No 3858 was bought and so began "The Luxurious Streamline Motor Cadillac Buick Service" for weddings, country tours, funerals etc. Business cards were printed and a driver was employed to drive the Cadillac, with casual help from nephews. The hire cars, always black, were kept meticulously clean and shiny: the introduction of vacuum cleaners was a great boon - especially for picking up confetti on Sunday mornings. After World War II began in September 1939, petrol was rationed, so eventually it was necessary to put a gas producer unit on the back of the Cadillac. In 1942, Lel bought a 1927 model 7 passenger La Salle, also fitted with a gas producer. In December 1943, a 5 passenger La Salle Reg No. 66 was purchased mainly to enable its petrol allowance to be used by the Buick, as Lel resisted stoically the concept of a gas producer on his beloved car. In March 1944 no.66 was lengthened to become a 7 passenger and by June that year the business card read "La Salle-Buick Service" with a photo of the La Salles and the Buick on the reverse side. Although the hire car stands in the city were used, by fare the majority of the work was arranged by Dolly over the phone. They had a system working whereby Lel would dial their home number to ask if there was a job in the area. He could hear Doll's voice, even through she couldn't hear his, so if she said "yes I have a job for You", he would put in a penny and receive the instructions. If she said "No Work: come home" they would hang up, saving many miles and the cost of a call! A 1936 model 7 passenger Buick joined the fleet a little later. It was bought from "The Melrose Estate" retaining its number plate 5678. He retained this fleet of cars until his death in 1954. During the war years the Grove Ave house became "open house" to many servicemen from their extended rural family. This sharing was a great source of joy for Lel and Dolly. Robert is the son of Robert John Holman and Eliza Rosanna Hawkins.